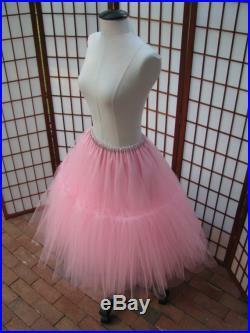 This listing is for a custom version of the tulle skirt shown in the photos. 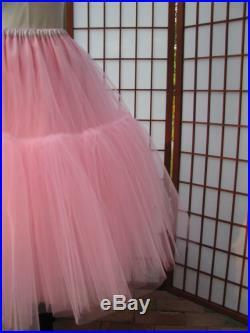 There will be 8 layers of 100% nylon tulle with each layer having two tiers. 75 (2cm) wide elastic within a polyester satin casing. 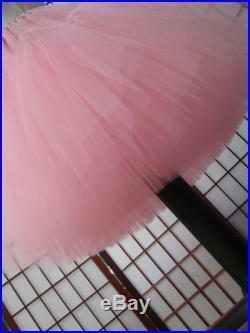 The upper tier of the skirt will be lined with the same polyester satin. 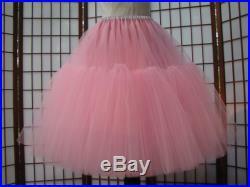 The skirt in the photos was made to fit a 31" (79cm) waist and is 26" (66cm) long. Waist: please select your waist from the listed ranges in inches or centimeters which will determine the price. Length: please let me know what length you require up to 25 (64cm). My work schedule varies constantly. 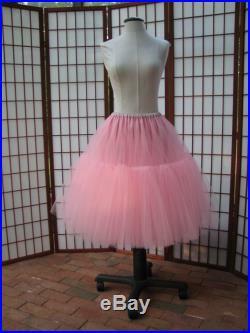 I require a minimum of 3 days to create one of these skirts, but it may take longer depending on my current orders and my stock of pink tulle and pink satin. I need an additional week to order fabric.